Cold Air: Estimating production from Ontario's solar panels. 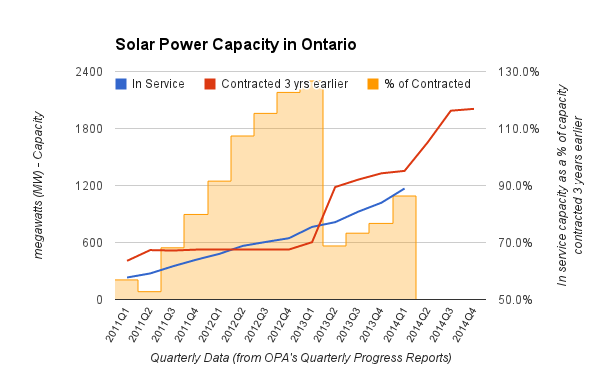 Estimating production from Ontario's solar panels. When the Ontario Power Authority (OPA) released data projections made in supporting the development of Ontario's latest Long Term Energy Plan (LTEP) they showed the cost of purchasing generation from solar would grow about $280 million in 2014 (in 2012 dollars), and $443 million in 2015. The OPA anticipated that 45% of the growth in in generation costs from 2013 through 2015 would be due to the costs of purchasing production from solar panels. 45% of the cost increase over a 2 year period puts solar, in 2015, as about 1% of supply but 10% of total supply cost (according to the OPA work for the LTEP). I've spent some time trying to incorporate hourly estimates of solar input into my tracking of Ontario electricity data. It's not easy, and it's dynamic, so I'm writing this post to explain how I'm estimating solar production, why my estimates change, why they are better than anything else most, if not all, will see - and what the estimates show. For most generation, the Independent Electricity System Operator (IESO) Hourly Generator Output and Capability Report provides an production,, and the capacities of the generators can be established. The level of data available for these generators is what is desired for solar output. The first two points are greater concerns with solar as most solar generators are "embedded" in local distribution company (LDC) and/or under 10MW in stated capacity. On the third point, of stated capacity, the IESO's supply overview page currently shows 1824MW of installed wind generation capacity. That may mean something in terms of internal IESO definitions, but the true installed wind capacity is much more meaningfully provided in the OPA Quarterly Progress Reports on Electricity Supply. 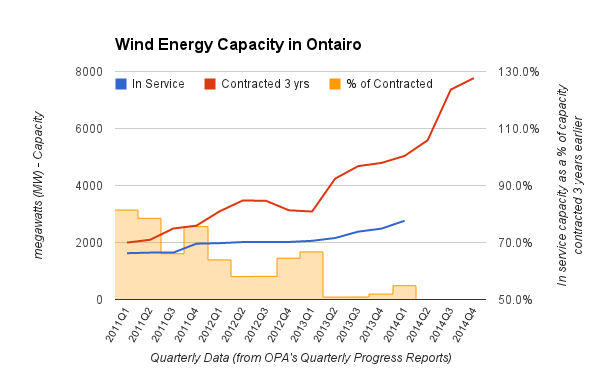 According to the OPA, at the end of March 2014 "in service" contracted wind capacity was 2762MW; OPA reporting show the IESO's claimed 1824MW was exceeded over 30 months ago, by the end of 2011. There's lots of reasons my assumptions may not be good predictions, including an inability to ramp up production to match the jump in contracted supply 3 years ago. I currently forecast in service solar capacity to be ~1732MW by the end of 2014. Another issue is that feed-in tariff (FIT) contracts allow suppliers to overbuild supply; a 1000 kilowatt solar contract may allow 1200kW of supply to be built. For my modelling this would, and does, show as higher than otherwise expected capacity factors in reporting solar performance. Capacity factors are what I attempt to collect from another data source at the IESO, combined with the painful method of asking for a number. The data source is the Variable Generation Forecast - from which I collect the hourly forecast for the next day's "Embedded" solar from the final report of the day (ie. hourly estimates for the 18th are from the final estimate on the 17th). The benefit of this category is there's a geographic distribution of sites. The bigger problem is ascertaining the capacity being tracked in the IESO forecast. I've asked (by email), but I don't ever put much faith in data that isn't posted, and I've come to distrust responses on this. I have chosen 430MW as the capacity of solar reflected in the IESO's Variable Generation Forecast during January 2014, and estimated total solar capacity for that month at 1067MW - and I've subsequently increased the assumed capacity in the Variable Generation Forecast in proportion to the increase in total installed capacity. Both figures will therefore be adjusted months after reporting as better information comes in the form of OPA Quarterly reports. While far from perfect, I've gone through the process to emphasize that data is better than no data - and an estimate is better than a total lack of estimates. The data I'm working with is indicating that generation from solar panels was not simply the most expensive supply, by unit cost, in the first half of 2014, it was also the generation source that was, averaged over the entire 6 months, least valued by the market. That may be reflective of the IESO's poor grasp on the generation source they provide the poorest data on, but it's also surely somewhat a reality in a northern climate where peak demand, during much of the year, is in the low light of dawn or the darkness of early evening. My current estimates show the capacity factor over the first half of the year averaged 19.4%. This seems very high, but a capacity factor of 17+% may be the real issue, and the 19.4% is as reflective of the over-build allowed under the FIT contracts as it is of panel efficiency. The capacity factor increased each month, from 9% in January to ~28.6% in June. I've also charted the OPA figures for wind (as I did above for solar); both had a drop in the share of contracted supply that became "in service" within 3 years of the initial feed-in tariff offerings, but solar recovered since mid-2013, while wind did not. My guess is this just means the wind avalanche is pending. It may also indicate that the lack of reporting on solar generation has lead to a lack of publicity on the cost of solar generation - unlike the wind data availability that has contributed to a broad awareness of issues with wind generation in the province, and an opposition that slowed the implementation of wind generation policies.